Patients are increasingly being put at risk by counterfeit or falsified medicines infiltrating the global pharmaceutical supply chain. The growing prevalence of this illicit trade has forced pharmaceutical and biotech companies, regulators and safety organisations to take action in order to protect patients. Clinigen is a global pharmaceutical and services company with a unique combination of businesses focused on providing ethical access to medicines across the pharmaceutical product life cycle. Its mission is to deliver the right medicine to the right patient at the right time. Clinigen is dedicated to providing an ethical, compliant way for healthcare professionals to source medicines. It manages its supply chain closely and guards against the risk of counterfeit products reaching the patient. With more counterfeit medicines making their way into the supply chain, it is essential for other businesses to follow Clinigen’s lead and take steps to address this growing concern. According to the World Health Organisation (WHO), falsified medicines are medical products that deliberately misrepresent their identity, composition or source. This term can apply to both branded and generic products. They are often disguised as authentic medicines but may contain the wrong ingredients or dosage. These products have not been properly checked for quality, safety and efficacy, and many don’t require a prescription to supply. They can, therefore, pose serious health risks if self-prescribed. Falsified medicines are becoming more sophisticated, and so the chance of them reaching patients has increased. The counterfeit industry can be very profitable for forgers, who operate outside the law and have no regard for patient safety. These criminals operate in many countries where the risk of getting caught and punished is relatively low compared with the illegal drugs trade. They use unlicensed online pharmacies to sell counterfeit medicines, concealing them among legitimate products. Products such as Viagra and diet pills were the initial target for counterfeiters, but they are now turning to heavy-duty medicines such as treatments for cancer, HIV and AIDS. 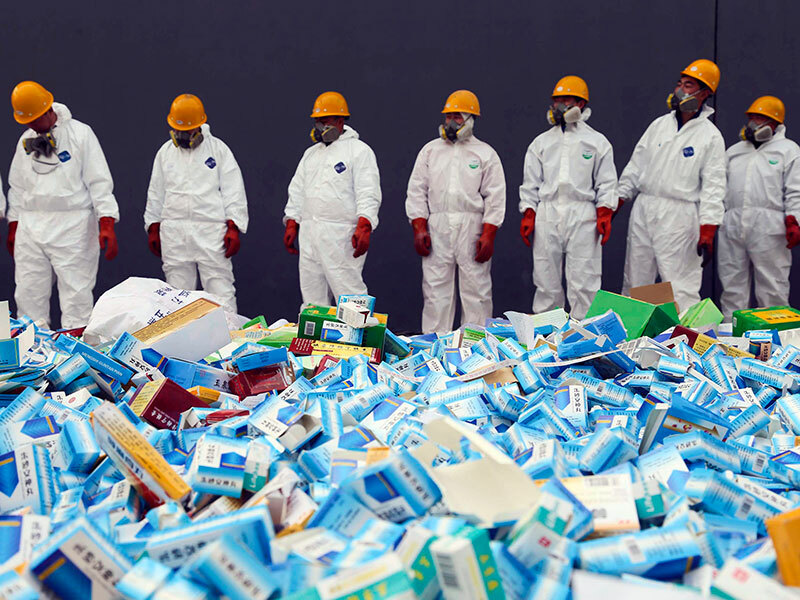 The illicit trade of such products is occurring on a global scale, with industry experts estimating worldwide sales of counterfeit medicines to be worth as much as €200bn annually. The infiltration of counterfeit medicines varies by region and is often dependent on the regulation in those territories. The WHO estimates that in some developing countries, over 30 percent of medicines in circulation are counterfeit. In many post-Soviet states the amount could be over 20 percent, while in developed countries with effective regulatory systems less than one percent are thought to be counterfeit. The impact of counterfeit medicines on human lives makes for difficult reading: it is estimated that fake drugs take 100,000 lives a year in Africa alone. It’s not just emerging markets that are feeling the impact of counterfeits either; according to a report published by the Drug Enforcement Administration, more than 700 deaths in the US between late 2013 and 2014 were related to the opioid fentanyl. The threat of counterfeit medicines is a global one, and so cross-border collaboration is needed to protect patients. The European Commission believes counterfeit medicines represent a serious threat to global health and has called for a comprehensive strategy both at the European and international level. The EU set up a legal framework in 2011 called the Falsified Medicines Directive. In the US, the FDA takes all reports of counterfeit medicines seriously and is working with other agencies and the private sector to protect the US drug supply from the threat of counterfeits. Many of the top pharmaceutical companies are also working to tackle the issue, and have been doing so for some time. For example, German pharmaceutical giant Bayer provides background information on counterfeit medicines on its website, highlighting the issue with the aim to protect its patients. There are many regional organisations that have been set up to protect patients. Clinigen is a member of both the European Alliance for Access to Safe Medicines (EAASM) and the Alliance for Safe Online Pharmacies in the EU (ASOP EU), two key European associations promoting patient safety and fighting to protect patients from the threat of counterfeit medicines. The general public is typically unaware of the dangers counterfeits present; these alliances, therefore, focus on educating patients and healthcare professionals of the perils of internet pharmacies. The EAASM and ASOP EU believe there are up to 50,000 active online medicinal product sellers globally, and that as many as 96 percent of them are operating illegally. To address the illegitimate supply of counterfeit medicine, the WHO has developed an initiative to inform regulators how to detect and report pharma forgeries. Since 2013, 600 regulatory personnel in 141 countries have been trained on preventing, detecting and responding to counterfeit medicines. In addition, Interpol regularly runs global initiatives targeting the online counterfeit market. Its latest undertaking, named Operation Pangea, ran in September 2017 and involved 197 authorities in 123 countries. It resulted in the seizure of 25 million fake and illicit medicines worth over $51m (€43m). More than 3,500 websites were taken offline and 400 suspects investigated. It is hoped that the mandatory global serialisation of licensed pharmaceutical products will go some way to eliminate the trade of counterfeit medicines. From November 2017 in the US and February 2019 in the EU, licensed products will be verifiable by a unique serial number linked to the product’s origin, batch number and expiry date. Serialisation will affect many parts of the supply chain, from manufacturing to dispensation to the patient. Implementation is, therefore, likely to be a significant hurdle for the industry; label design, data management and budgeting will all be affected by the change. The aim of serialisation is to increase transparency and visibility, which will help reduce counterfeiting. Through its commercial medicines department, Clinigen has its own speciality pharma portfolio, plus it runs clinical trial services that supply licensed comparator products. With such a varied role in the pharmaceutical sector, the company is committed to ensuring all aspects of its business are fully compliant with serialisation regulations both in the US and the EU. Clinigen is dedicated to fighting fake medicines; it works with regulatory authorities and the appropriate associations to raise awareness of counterfeits. The company also manages, supplies and distributes both licensed and unlicensed medicines. Furthermore, it interacts with pharmaceutical companies and healthcare professionals alike. Clinigen’s extensive reach in the market means it is well placed to understand the many challenges present in the pharmaceutical industry, the most pressing of which is the threat counterfeit medicines pose to patients.